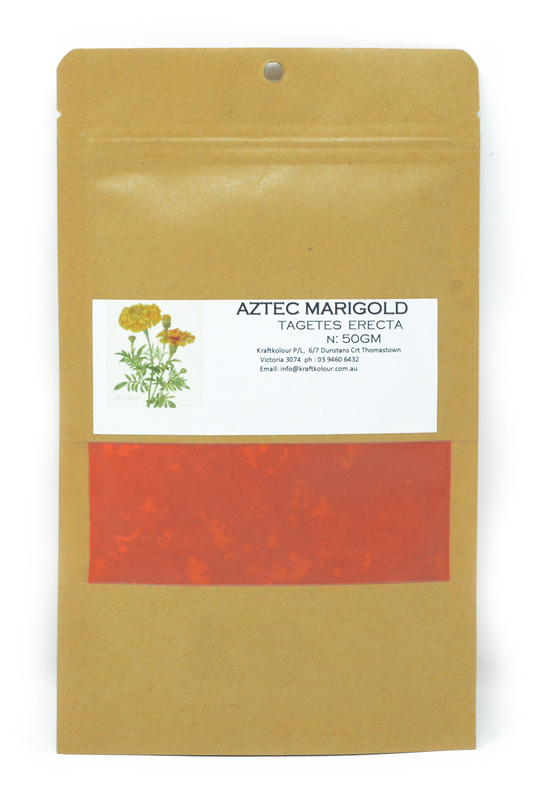 This dye extract is derived from Aztec Marigold - also know as Mexican Marigold (Tagetes erecta) and is native to Mexico/South America. The plant grows to 50 - 100cm and was commonly used by the Aztecs for medicinal, cultural and decorative purposes. In Mexico, its flower - the cempasúchil is called the flor de muertos ("flower of the dead"). Aztec Marigold been used for medicinal purposes since prehistoric times. The Cherokee used it as a skin wash and for yellow dye. Today the flower petals are a colourful addition to salads and the dried ground flower heads used as food colouring. Bright yellows, pale yellows, lichen greens can be achieved as a natural dye.